1. Count by Gold : 7th behind China, Japan, SoKo, Indonesia, Iran, Taiwan. For #3, if you ignore Indonesia's 15 traditional martial arts golds, then we're #4 behind China, Japan and SoKo, ahead of Iran, Indonesia and Taiwan. Finally, all those diehard card players on howrah/sealdah local trains (who play even while standing up in sardine packed trains, using someone's hand as a card table ) have role models to look up to. long live the sealdah-bandel and kolaghat local finally we weaponise some of our hidden strengths! There is hope for all of us now! Bridge!! Will it be there in future games as well? If we couldn’t win it, I’m pleased that SHQs land Japan won both hockey golds . Better than wannabe TSP Malaysia winning it. Amit Panghal's win is very creditable. Dusmatov beat the Cubans and other CAR competitors on the way to gold at Rio 2016. And then in 2017 he beat Amit in the quarters on the way to losing to the Cuban in the final of the world boxing championship . This was Amit's revenge, but no one expected this win as he had the hardest opponent - an Olympic champ and world silver winner - to beat. Special mention to coach Santiago Nieva, under whom the boxers have improved dramatically, with several golds at CWG 2018 followed by this gold at the far more competitive AG level. I hope they keep him around until the next logical step - medals at Tokyo 2020 - at least. the japanese hockey team seems to have a indian coach. Singha wrote: the japanese hockey team seems to have a indian coach. Actually it is Siegfried Aikman from netherlands. We improved but so did a lot of other countries and not just because of some new local events. Checking some previous Asiads, China had been losing gold and total medal shares since 2010. They had 199 golds and 416 total medals in 2010 but just 132 and 289 in 2018. Also Korea usually goes 200 total medals per Asiad but only 176 this year. Many countries are starting to claw large chunks of bling from the traditional dominance of the big three East Asian powers. Indonesia has 98 total, Kazakhstan 76, Thailand 73, Uzbekistan 70, India 69, Taiwan 67, Iran 62. So a lot more countries are competitive now. Good news is the top three is vulnerable. Bad news is we have to fight a large pack of pretenders sensing blood for the right to storm the gates. We need to make a minimum goal of finishing on top of this ravenous pack at fourth and then begin our assault on the top three. Glad that we reached 15., potential was 18-20 & minus the african imports 20-22 gold. That would have put us in fifth/sixth position. disha wrote: Glad that we reached 15., potential was 18-20 & minus the african imports 20-22 gold. If we consider only Olympic sports and exclude imports, (giving us 6 more gold) we would be 4th. world's premier sporting nation, in time for the 2008 Olympics. However, they regressed considerably since 2008 OG and 2010 AG, so their model and heavy investments are not working. On a `per capita' basis, Taiwan got more medals, so did other countries with an equivalent per capita income (so did Haryana, with lower income). A large no of China's medals have come in sports that had no serious competition (Canoeing, Diving /Artistic swimming, Wushu & TT gave them 40 Gold). As other countries catch up - as they have in Badminton & TT, this will fall. Last edited by Deans on 02 Sep 2018 12:13, edited 1 time in total. all that sports money got diverted to building up the PLAN hulls. What lessons can we learn and imbibe from this very encouraging performance at Asian games? Singha wrote: all that sports money got diverted to building up the PLAN hulls. Taiwan spent a lot of money preparing for the 2017 Universiade. It was a big deal for them, and they got a sporting boost out of it. As for lessons, one common theme here is that success is driven by coaching skills developing. From Swapna Barman to Arpinder Singh to Amit Panghal, all had coaches who spent time to train and improve their raw talent. Swapna's coach lived away from his family for 5-6 months - to train a teenaged girl into India's first Heptathlon champ. Arpinder lost his direction after 2014 CWG bronze, and his earlier foreign coach led him astray. His current coach and him spent 2 years rebuilding his jumping technique all over again, and now he's won gold. Santiago Nieva has completely redone the boxers' training, and suddenly they won 9 medals at CWG including 3 golds and 3 silvers, and the gold here was against the hardest possible opponent - the reigning Olympic champion and worlds finalist. Harendra Singh would get a similar mention but for his wards blowing it on the big stage in the semifinal of the hockey event. Sjoerd Marijne is doing a great job with the women, despite the loss in the final. Even swimmers have improved dramatically. 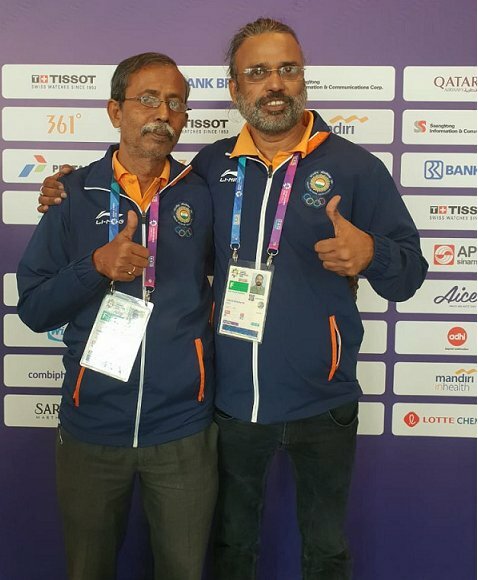 Both at CWG and AG, they broke their national records several times over, and are repeatedly making semis and finals, instead of losing in the heats, if they even managed to qualify. One more cycle and they might be among medal contenders. If we want to dramatically boost AG gold tally, we need to target medal rich niche sports, especially those with OG ability. Canoeing, Kayaking for example. Might as well steal PRC's easy dumplings out of their plates while we're at it. Our Kurash team are entirely ex Judokas who switched over, did 2 months training in Uzbekistan and voila, silver and bronze in a sport no one's heard of in India before. Hockey and Kabaddi gives us 4 medals after several days of play and hopefully no mistakes. A dozen canoers, rowers or kayakers can get us many more. Disappointing yes, but that's the nature of team sports - there are just too many moving parts for them to be sureshot golds. The effort:medal ratio is just too high. A judoka or wrestler in comparison can win a gold with 4-5 matches of 6 min each. * Neeraj Chopra: possible. Needs to push his peak throw distance to 90m. The two Germans are repeatedly hitting that, and there's a second string of whom Neeraj is one. However, in OG historically the throwing distances have never been very high, and 86-88m has usually guaranteed a medal. Neeraj's plus is that he has great big match temperament. He's just 20, which is either a plus or minus. Javelin throwers peak from 24-30. * Vinesh Phogat: beat the main Japanese and Chinese in her weight class here. Eri Tosaka didn't participate in this AG, and will be her main opponent. The 2nd ranked Japanese Yuki Irie, Vinesh beat in the final . She also beat the Rio silver medalist Sun Yanan - the same woman who broke her leg at Rio. * Mirabai Chanu: She's going to need to lift 200kg or more to win gold , probably. Strong competition from NoKo and Thailand. Gold at Rio 2016 was 200kg, gold at AG2018 was 199kg. She lifted 194kg to win the 2017 world championship, and 196kg at CWG2018. * Bajrang Punia: getting better and better in his weight class. Unless he's unlucky, he has a good chance of medaling. Amit Panghal: Needs to take on Cubans and CAR folks more often and gain confidence to make it to medal round in OG. Santiago Nieva is helping fix the main problem of Indian boxers - outdated training. We also have a chance in Badminton and women's boxing. We need a good draw and one win against a top 10 player (which Saina, Sindhu and some women boxers have done) to get a bronze. Same applies for men's boxing in a couple of other weight categories. Suraj wrote: Taiwan spent a lot of money preparing for the 2017 Universiade. It was a big deal for them, and they got a sporting boost out of it. But I do want to say that team sports are prestigious. Ok maybe not kabbadi. But a soccer or basketball gold would resonate throughout Asia. Of course, cricket would be a big one if the host doesn’t drop it and the BCCI sends a team. Beedees and Sinhalese won the two times it was played at Asiad. Pakis managed a bronze onlee. I believe there are 3 reasons why Govt's might have a role to play in sports. articulated by our sports minister, who is not seduced by vanity projects like hosting the Olympics. 2. Where a sport is popular (because people's needs are important in a democracy) provide sports facilities and competition that will draw public interest. e.g. more hockey grounds and tournaments. Here it makes sense to invest in popular sports and get international medals. should avoid as there are better things we can do with the money, which will `give the people bread rather than a circus'. chola: I care nothing about relative prestige of medals as long as he sport is competive . Gold is gold . Sure, to win hockey gold is a separate aim . But when we talk of a multi sport event, the first goal is to maximize medal count . Even arguably prestige wise, Amit Panghals gold beating the OG champ has more prestige than anything hockey team would have gained beating much lesser ranked teams to gold - which they didn’t anyway . Winning a lot of medals is satisfying , and it reinforces a positive cycle of accomplishment because others in the contingent at the games village become intensely envious and want theirs . One heartening thing is that no one moans about ‘exposure’ anymore . They’re well prepared and they win . Some of our winners are much too young for that even. Men’s double trap silver medalist Shardul Vihan is 15; during the previous AG the kid had not even reached puberty . So watch out, some 10-12 year old you see could be AG gold winner in 2022. I’m not convinced our women’s boxers are good enough for Tokyo. They may get lucky, but they’re not a prospect if they drew a blank here . Sindhu yes she can once again valiantly make the final... and lose. I have given up hope that she will ever win anything major (eg OG, WC or All England). I will put Hima Das in that list too. She has reduced 5 sec in 12 months from 55+ to 50+. If properly trained for the next couple of years she can go 49+ where she becomes medal prospect. Australia, England, India, New Zealand, Malaysia, Japan. Here are core probables of the Jr. Team. In my opinion Jr. Team has improved by leaps and bounds! Our future champions! With young boxers fresh from Boxing World Youth Championship in Hungary. We had a splendid haul: 2 GOLD, 2 SILVER & 4 BRONZE for girls, and 2 BRONZE for boys. Well done, young stars!
. At a felicitation ceremony in New Delhi on Tuesday, Divya told Kejriwal that she could have won gold at the Games with proper support from the government. "You've gathered us today to congratulate us but there's no support provided when we need it most. If we're given that support at the right time then we can even win gold," Divya said. "I'd won a medal at the Commonwealth Games (in Gold Coast, Australia, earlier this year) and you had told me that I will receive more help going forward. I gave all the help I needed in writing but even my phone calls were not answered," Divya added. Damn babus. Taking credit by association when our athletes win a medal but doing nothing to actually help them win. I’m glad Divya came out and said this! this is an excellent gesture. Rahul M wrote: this is an excellent gesture. It's good to have someone like Rathore in charge here. He actually gets what it takes, and what they face, having been one of them a decade ago. He is the best sports minister ever!! If he is in charge for 5+ more years we will be running neck to neck with China!! Suraj wrote: It's good to have someone like Rathore in charge here. He actually gets what it takes, and what they face, having been one of them a decade ago. Yep!! In Punjab/Haryana lots of religious organization are helping sports. Sant Balbir Singh seechewal even created an astroturf stadium in Seechewal village. 31 of asiad medal winners were age 21 or below. Arpinder Singh wins bronze in triple jump in IAAF continental cup, first Indian. PU Chitra finshed 4th in 1500m, Jinson Johnson 7th in 1500m, Mhd. Anas fifth in 400m.